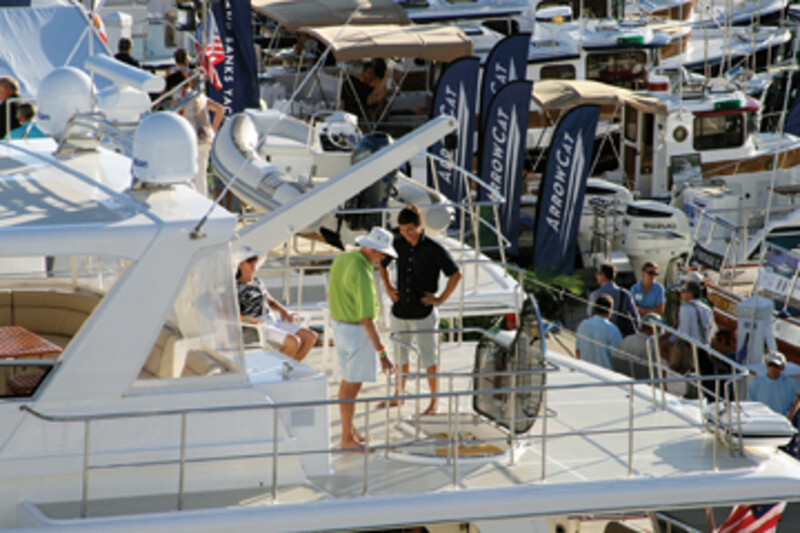 The Fort Lauderdale International Boat Show finally caught a break this year in the form of fine Florida weather. Sunny skies brought out big crowds on each day of the show. 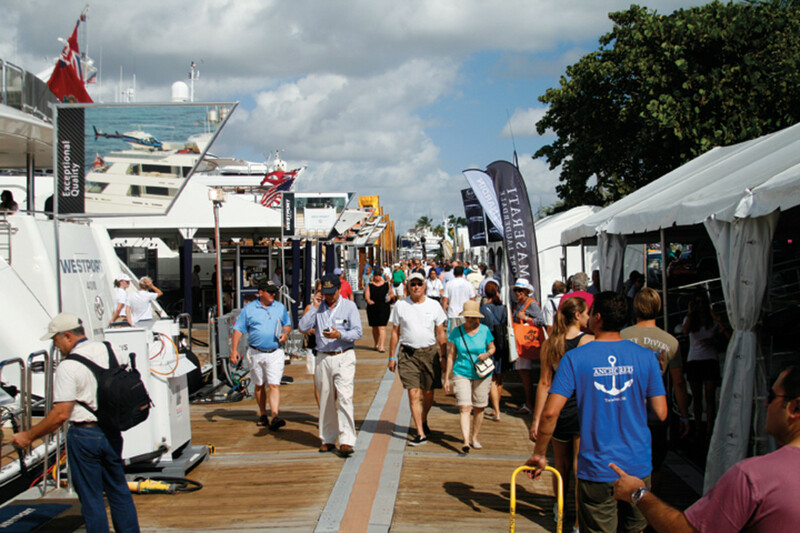 After successive years of challenging weather (too hot one year, too rainy the next and Hurricane Sandy lurking offshore last year) the Fort Lauderdale International Boat Show finally caught a break this year in the form of fine Florida weather, a wealth of new product launches and perhaps the tailwind of a recovering market. 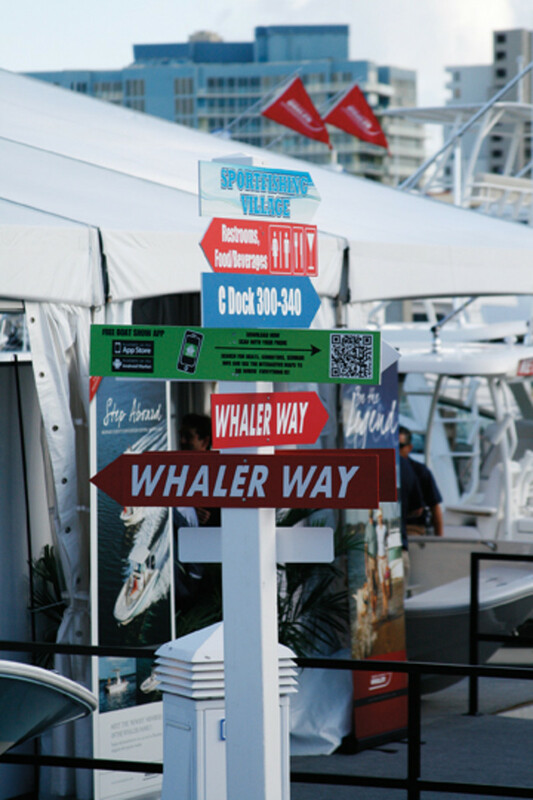 In response, the crowds came in numbers to the show’s 54th annual edition Oct. 31-Nov. 4, which featured more than 1,500 vessels across six locations. Another notable category of growth came from a 15.9 percent increase in the number of boats under 80 feet on display — an important market sector. This year saw the largest number of boats under 80 feet ever on display at the show. More important, there was a clear sense of buoyancy among exhibitors. Many say they came away with signed contracts, some of them boasting that it was the best Fort Lauderdale show in years. They agree that new product and innovation were driving forces for sales. As usual, MarineMax came in force, with 91 boats on display covering 11 brands at 11 locations, and well over $100 million in product as well as 100 people working. The result: a 25 percent increase from 2012 in unit sales and dollars, “which is huge for us,” Cashman says. Declining to reveal a more precise number of signed contracts than “several dozen,” he says sales were strong across the spectrum of models from 13 to 80 feet and were skewed more toward new than used, compared with the 2012 show (90/10 percent this year vs. 80/20 percent at last year’s show. “It’s a good sign that people are coming back to new,” Cashman says. As has been the industry trend of late, outboard-powered boats dominated MarineMax sales. Of note, he says, the Azimut 80 Fly was introduced at the show and MarineMax wrote a contract for the yacht. “We were very excited to walk out of there with a deal on it,” he says. Looking to 2014 and beyond, Cashman remains optimistic. Continuing the trend, sales were broad across Sea Ray’s 18- to 65-foot lineup, led by introductions of the 510 Fly, 350 SLX and 260 Sundancer. Thursday night fireworks form a colorful backdrop. Sea Ray launched 12 newly designed boats in 2013, and 10 more are planned for 2014. “It’s not just the presence and presentation, but you’re seeing a lot of new product,” Guilford says. Partly in response to Sandy and partly to make a statement, the hub of Sea Ray’s exhibit was an air-conditioned glass tent that provided an enclosed in-water display for debut of the largest two boats. Randy Caruana, vice president of sales at Mercury Marine, says joystick systems led the day and that sales for the engine manufacturer exceeded pre-show expectations. Viking Yachts reports a bump in both foot traffic and boat sales — 12 solid deals done for sportfishermen ranging from 42 to 70 feet. Frederiksen says business is booming. Viking sold 32 boats during a 2-1/2-month period this spring, he says, and has since opened a fourth production line and is interviewing prospective new employees. Boston Whaler declined to offer specific sales figures, but Jeff Vaughn, vice president of sales, marketing and customer service, says the company surpassed good 2012 results. Checking out the finer points. Chris Wainscott, regional sales rep for Regulator Marine, says the builder sold a Regulator 25 that was introduced at the show and a new 28 and collected “a good number” of solid leads. “We had several sales on site and lots of activity in the days following the show, with many more to come,” Wainscott says. British builder Fairline Boats also reports a successful Lauderdale. “We’ve enjoyed strong sales at the show, further reinforcing the evidence of recovery we’ve seen in the U.S. market,” Oliver Winbolt, head of marketing, said in a statement. Fairline displayed its flagship Squadron 78 Custom; the Squadron 65, 50 and 42; the Targa 62 Gran Turismo, which was launched at last year’s show; and the Targa 38 Open. Fairline also showcased a piece of its history with the iconic Fairline 19 (the company’s first model, launched in 1967) as part of its celebration of 45 years of boatbuilding. Blane Aarup, CEO of Germany’s Bavaria Motorboats North America, says he expects to come away with at least two sales of the Virtess 420 Fly, the 2013 European “powerboat of the year,” which made its U.S. debut at the show. Bavaria also collected a number of promising leads at the show, and even added to its dealer network. 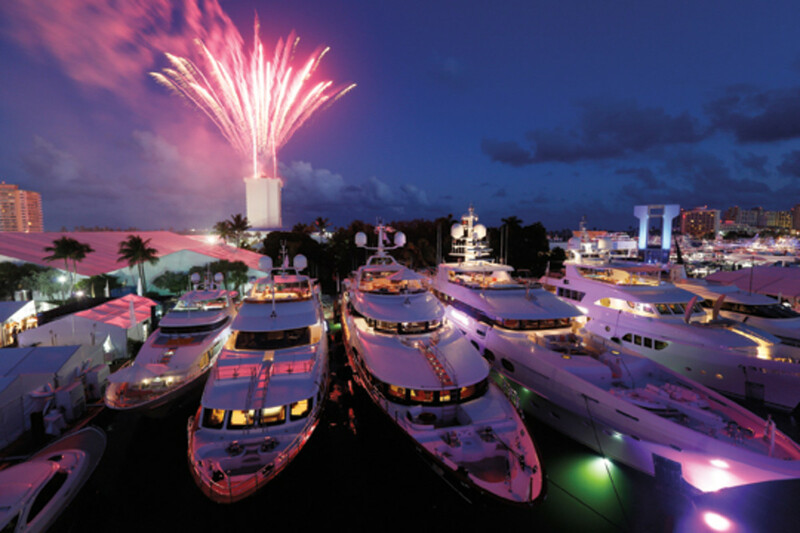 “I’ve been coming to FLIBS for a quarter of a century and this acceptance — with over 100 client leads, a dealer on the East Coast and a dealer on the West Coast, with three others pending … was virtually overwhelming,” Aarup says. Chinese builder Cheoy Lee used the show to introduce its new 87 Alpha Sportbridge Express Yacht, as well as an opportunity to present a “more open and transparent” face to the public, says Gene Weeks, express project manager at Cheoy Lee Shipyards NA. Gone was the pre-qualification requirement to board a $5 million yacht, replaced by open-door guided tours of the four yachts on display and a big invitation-only bash on the docks. Weeks says the contrast between the 2013 and 2012 Lauderdale shows was like night and day for Cheoy Lee. Beyond the busy docks, the accessories tents and convention center were active. Dean Silver, a southeast regional manager for Furuno says the electronics manufacturer had its best Lauderdale show in years. SureShade, the relatively new retractable sun shade accessory manufacturer, continued its steady growth at the show. Twenty-three boat lines sported SureShade products. Zimbalist says that for the most part the feedback he has received from exhibitors is right in line with that. Zimbalist notes that the brokerage market remains strong and that the superyacht market still is robust at the high end. This article originally appeared in the December 2013 issue.